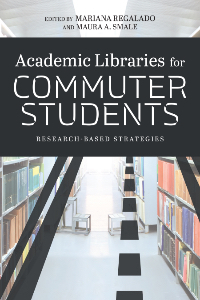 We’re delighted to share the news that our new book was just published by the American Library Association: Academic Libraries for Commuter Students: Research-Based Strategies. It’s available directly from the publisher ALA Editions (among other vendors), and you can take a look at the book’s Chapter 1 and Index on the ALA website as well. This edited volume brings brings together research by librarians and academics at public community and baccalaureate colleges and universities from across the U.S., commuter institutions and those with both commuter and residential populations. It’s been amazing to work with our talented contributors, all doing terrific work with and in support of commuter students in their libraries and institutions. The Table of Contents is below, and there’s a press release from ALA as well. We’d love to hear your feedback, feel free to get in touch! With our terrific colleague Prof. Jean Amaral (BMCC) we’ve just published “Online Learning with In-Person Technology: Student & Faculty Experiences in Hybrid/Online Courses at CUNY.” In this report we share findings from our qualitative research on students taking and faculty teaching hybrid or online courses at BMCC, Brooklyn College, and City Tech during the 2015-2016 academic year. Please download and share widely, and get in touch with any questions or feedback! We’ve been researching the CUNY student experience for a while now, and have collected an enormous amount of data: interviews with students and faculty (subsequently transformed into transcripts and coded), student photographs and drawings, and geocoded map locations. And for years we have wanted to find some way to showcase the visual data, and especially the photographs taken by and drawings done by CUNY students in 2009-2011. If you’ve seen us present or looked through our slide decks you’ve seen some of these images. They are AMAZING, full of detail and nuance and movement and challenges and triumphs, and we are so grateful that students shared them with us during our research. We are thrilled to share our new website, Finding Places, Making Spaces. This website presents selected visual data from our research with CUNY students in 2009-2011 at BMCC, Bronx Community College, Brooklyn College, City College, Hunter College, and City Tech. Students sketched maps of their daily routes, photographed items related to their academic lives, and drew representations of their research processes. These visualizations augment our publications on this research, and provide an alternate way to learn about what we learned from CUNY students. We’ve included photographs that students took of places and technology, drawings that students made of their process when completing a research assignment, and timelines created with maps that students drew of the activities of a typical school day. All are accompanied by quotes from student interviews, to contextualize the images in students’ own words. Please take a look at https://ushep.net/. We’d love to hear what you think. We were delighted to present at Hunter College’s ACERT (Academic Center for Excellence in Research and Teaching) last week, talking about our research on the CUNY student experience. We focused here especially on student taskscapes: what they’re doing, where and when, with what tools or objects, and around which other people, and especially the challenges or successes they find. Many thanks to Jeff Allred (English, Hunter) for inviting us to present, and to everyone at ACERT for a great event. Jeff’s written a blogpost about the event on the ACERT website, and the excellent ACERT videoteam have also posted a video capsule wrapup. I’m on sabbatical for the spring and early summer, working on a study of undergraduate attitudes and practices around their course reading that should complement our research on students’ lived experiences at CUNY. I’m interested in how our students get access to what they need to read, their process while reading (for example, do they take notes? where do they find space and time to read? ), how they prioritize the task of reading, and where they encounter frustration and success. Are there any questions you thought I would ask that I didn’t? This question closed out most of my 30 interviews with students and elicited a variety of responses. It’s not a question I’ve asked of research participants before this study, though it seemed like a potentially useful twist on the “is there anything else you’d like to share?” question that I’ve often used at the end of interviews. BMCC* Students: I’m a City Tech professor doing a study on college students and course reading, and I’d like to interview you. Underneath that was a bit of text about participant incentives, my name, and the email address to use to contact me for more information or to join the study. When students emailed me I responded briefly with information that was mostly logistical: participants must be at least 18 years old, interviews will take about 30 minutes and be audio-recorded, the Metrocard/Amazon giftcard is for $10. When students came meet me for an interview, the first thing I did was ask them to read and sign the consent form, as required by CUNY’s Institutional Review Board. The form is 1 1/2 pages long, and while there is a brief summary of my project, it’s predominantly required text about potential risks and benefits, confidentiality, participant rights, and non-participation or withdrawal. In my experience most students read through consent forms fairly quickly; I always ask students if they have any questions before signing, and most don’t. Looking back at students’ responses to my new last interview question has been fascinating. Most students replied with “no” or some variation on no, like this student from BMCC: “You actually asked all the right questions.” And this somewhat humorous response from a City Tech student: “I think you’ve asked a sufficient amount of questions” (laugh). A Brooklyn College student thought I would ask about their prior experiences and background with reading, because “a lot of college students hate reading and, like, dread it.” They further speculated on the source of students’ reading struggles: “maybe because they just don’t have really good foundations in reading.” Since I did ask students about their experiences with reading in high school or educational settings before college, as well as about their struggles with reading, I was glad to hear that this student’s expectations matched the interview’s reality. A couple of students replied that they thought I would ask them to read during the interview, like this Brooklyn College student: “I thought I would come here to read something and you would get my opinion on that.” This student also shared that “I really like that it was specified towards me.” In prior rounds of research we’ve heard from students that mapping their days and considering their research process offered an opportunity for self-reflection that they found valuable, and I think this student’s response hints at that kind of reflection as well. Several students across all three colleges told me that they thought I would ask whether their reading was difficult or interesting, or about specific topics for reading “like, for English classes” (City Tech). A BMCC student expected me to ask about their process for writing papers, which makes sense given that a paper is often the end result of reading that students are required to do. A few students responded to my question by asking for more specific information on my study, including what I planned to do with the results of the research. Some students had asked this question when they initially emailed me (and one student mentioned that my email had answered all of her questions). In response to the students who asked for more details I shared a bit about my role as a library faculty member and wanting to learn more about what kinds of course materials students need and where they encounter barriers accessing or reading them. I also let students know that I’ll be sharing the results of my research both within CUNY and more broadly via conferences and publications. Looking back at all of these student responses makes me think that I should add a sentence or two about the purpose of the research to my email with students when signing them up for the study. I also wonder whether I’ve been clear enough about the purpose of my research on the consent form, though it’s unavoidable that some of the required language on the consent form is quite dry (and with its length it’s easy for participants to treat it like terms & conditions and just read quickly and sign). Overall I think this new twist on my final question is a good one, and I’m inclined to keep it for the future. We were thrilled to be invited to present the keynote at Teach @ CUNY Day yesterday along with Natalia Ortiz, doctoral student in Urban Education at the CUNY Graduate Center. Our presentation was a broad overview of our research into how CUNY undergraduates fit their academic work into their lives, focusing on study locations, the technology they use, and how they do research in their courses. Natalia’s terrific presentation also spoke to our students as whole people and ourselves — faculty and staff — as whole people as well, and it was lovely to experience that synergy. Both presentations were livestreamed if you’d like to check them out, and here are the slides and notes from our presentation. Many thanks again to Luke Waltzer, Director of the Teaching & Learning Center at the GC, and all at the TLC for inviting us to speak and participate in a great day of workshops and conversations. We had a great time this morning facilitating a workshop for our CUNY library faculty colleagues on using ethnographic methods to learn more about our libraries and communities. Beyond talking the talk, we also asked our colleagues to walk the walk and gather a small amount of data about their own scholarly habits and about the reading rooms surrounding the workshop space. 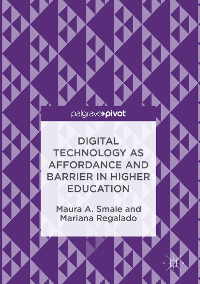 We’re thrilled to share the publication of our book: Digital Technology as Affordance and Barrier in Higher Education. The book is available directly from the publisher Palgrave Macmillan (among other vendors), and you can take a look at a preview in Google Books. The book incorporates much of our research over the past 8 years on how CUNY students do their academic work, with a particular focus on their use of technology. We learned so much about the ways that students want to and try to use technology — their own as well as college-provided — to create time for their academic work, and the ways that unanticipated barriers of technology can stand in their way. The official book description is below. If you read it, we’d love to hear your thoughts — please get in touch. We had a great time presenting at two conferences this semester, and are delighted to share our slides and speaking notes with you. First up was the Library Assessment Conference in November, where we presented A Day in the Life: Practical Strategies for Understanding Student Space-Use Practices with Andrew Asher, Jean Amaral, Juliann Couture, Sara Lowe, Donna Lanclos, and Barbara Fister. This link is to our slides — the paper will be published in the conference proceedings soon, and we’ll post a link when it is. Just last week we presented at the CUNY IT Conference on our research from 2009-2011 and 2015-2016 on students’ use of technology for their academic work. We’ve posted here both the slides and the notes from our talk. We had a terrific time at both presentations, many thanks to all who came and asked so many great questions! We had a busy year of new data collection during 2015-2016 and are looking forward to sharing the results of that research this year. First up is the Library Assessment Conference in Arlington, VA, in early November. We’ll be presenting on the Day in the Life project with colleagues Andrew Asher (Indiana University), Juliann Couture (University of Colorado, Boulder), Jean Amaral (BMCC), Barbara Fister (Gustavus Adolphus College), Donna Lanclos (University of North Carolina, Charlotte), and Sara Lowe (Indiana University-Purdue University Indianapolis). For this project we used text messaging to facilitate students’ self-reporting of their activities, and geocoded the results to create maps of where students traveled throughout a typical schoolday. It’s been so interesting to see the similarities and differences between how, where, and when students do their academic work at the 8 institutions. In December we’ll be presenting at the CUNY IT Conference on the results of our research on how digital technology can be used by students to create time and can thwart students’ efficient use of time for their academic work. We’ll be talking about data collected during our first round of research in 2009-2011 and a follow up study of student technology use last year in 2015-2016. We’ll post the slides/storify/notes for both presentations as soon as we can.